American portrait miniatures find their antecedents in sixteenth-century England during the reign of Henry VIII. This intimate art form enjoyed its heyday in America from about 1760 to 1850, when photography overtook miniature painting as a quicker, less expensive means of portraiture. Until the 1830s most small-scale portraits painted on thin, oval slices of ivory were worn as keepsakes in metal lockets. 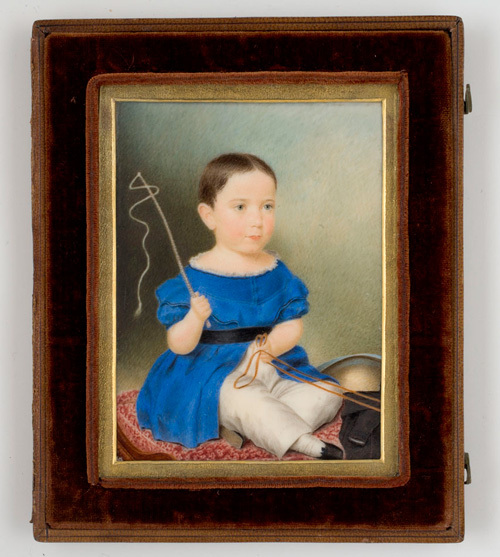 During the 1820s and 1830s a growing percentage of miniatures were painted on slightly larger pieces of ivory, often rectangular in format and framed in hinged leather cases that could be displayed on tabletops. It was about this time that a number of women- like Eliza Goodridge and her sister Sarah (1788-1853), both born in Templeton, Massachusetts, in Worcester County- became recognized miniature painters. When Eliza painted young Stephen Salisbury III (1835-1905) pretending to drive a carriage, she was staying in Worcester at the home of family friends, where her patrons came to sit for their portraits. Salisbury founded the Worcester Art Museum in 1896, and his gifts and bequests of painting, sculpture, furniture, miniatures, and daguerreotypes form an important nucleus of the American collections.